Cosway Estates are delighted to offer a large Four Bedroom Link-Detached house located within easy access of Mill Hill Broadway. This spacious property has numerous benefits including a brick block paved front drive with off street parking for numerous vehicles. The ground floor accommodation comprises a large entrance hall with doors off to a living room and the diner area, both with wooden flooring. The living room has french doors leading to a beautiful conservatory / TV / Living room. The downstairs lobby offers entrance to study, shower / WC and utility rooms. To the rear of the property is a fantastic conservatory that could offer as a second living room. The diner area opens to the modern kitchen that comprises high gloss units. The first floor comprises an impressive Master Bedroom approached via its own lobby with separate entrance to the en-suite shower room. 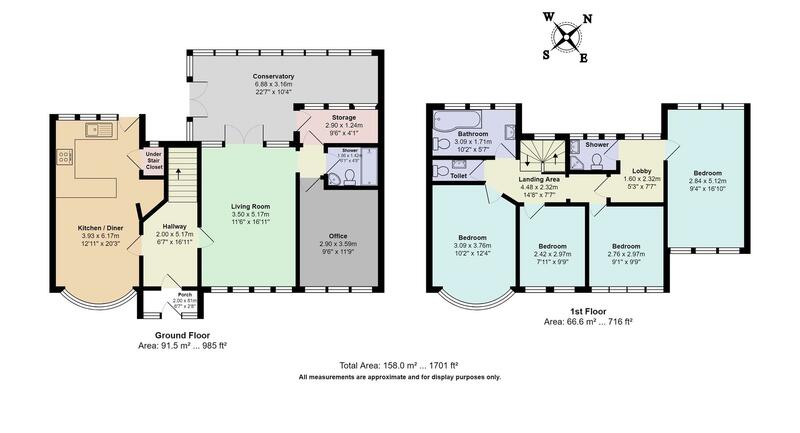 There are 3 further generously sized bedrooms, a 3 piece family bathroom and a separate toilet. This wonderful family house is offered in good order and viewing is highly recommended.